The wide-ranging implications of the shift to a sharing economy, a new model of organizing economic activity that may supplant traditional corporations. Sharing isn't new. Giving someone a ride, having a guest in your spare room, running errands for someone, participating in a supper club-these are not revolutionary concepts. What is new, in the "sharing economy," is that you are not helping a friend for free; you are providing these services to a stranger for money. In this book, Arun Sundararajan, an expert on the sharing economy, explains the transition to what he describes as "crowd-based capitalism"-a new way of organizing economic activity that may supplant the traditional corporate-centered model. As peer-to-peer commercial exchange blurs the lines between the personal and the professional, how will the economy, government regulation, what it means to have a job, and our social fabric be affected? Drawing on extensive research and numerous real-world examples-including Airbnb, Lyft, Uber, Etsy, TaskRabbit, France's BlaBlaCar, China's Didi Kuaidi, and India's Ola, Sundararajan explains the basics of crowd-based capitalism. He describes the intriguing mix of "gift" and "market" in its transactions, demystifies emerging blockchain technologies, and clarifies the dizzying array of emerging on-demand platforms. He considers how this new paradigm changes economic growth and the future of work. Will we live in a world of empowered entrepreneurs who enjoy professional flexibility and independence? Or will we become disenfranchised digital laborers scurrying between platforms in search of the next wedge of piecework? Sundararajan highlights the important policy choices and suggests possible new directions for self-regulatory organizations, labor law, and funding our social safety net. So all in all, a very interesting book by one the most knowledgeable researchers on the sharing economy. Well worth a read. -The Enlightened Economist Sundararajan knows his stuff. He's an award winning scholar who writes with a clarity that masks the compleity of his subject. -Finance and Development In his new book, Arun Sundararajan paints a rosy picture of the revolutionary companies and platforms that are altering the nature of work. 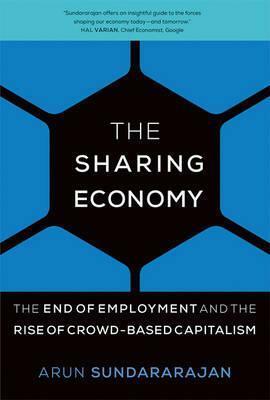 -Strategy + Business Sundararajan...sees enough value in the sharing economy. -TED His case for optimism in his new book is compelling in large part because it comes from a business-school wonk and not a 'sharing!' proselytizer devoted to the literal meaning of the word. Arun Sundararajan is a Professor at New York University's Stern School of Business. A recognized authority on the sharing economy, he has published op-eds and commentary in such publications as Time, the New Yorker, the New York Times, Wired, Le Monde, Harvard Business Review, and the Financial Times.